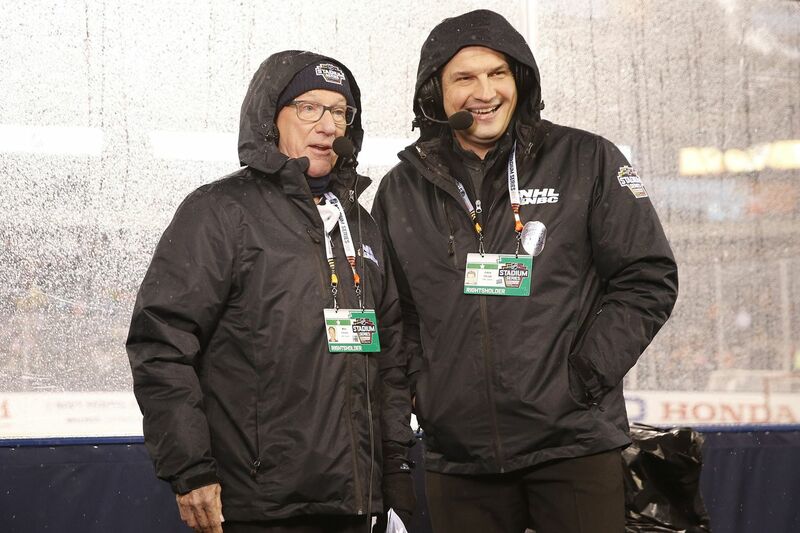 NBC hockey announcers Mike Emrick (left) and Eddie Olczyk before the Flyers play the Pittsburgh Penguins in a Stadium Series game at Lincoln Financial Field on Saturday, February 23, 2019. The story before the game was the rain. Quickly, the game became the story, and that is what NBC wanted all along. Even in the third period and overtime as rain intensified, the game won out, with the Flyers overcoming a 3-1 deficit for a 4-3 overtime win over the Pittsburgh Penguins on Saturday in the Stadium Series game at Lincoln Financial Field. Despite the heavier late-game rain, NBC’s plan remained the same, even if it meant a few soggy announcers, who broadcast the game at ice-level to the right of the penalty box behind the boards. “It will take me a little while for my feet to thaw out because of the rain,” NBC play-by-play broadcaster Doc Emrick said afterward. Good thing Emrick’s analyst, Ed Olczyk, remembered to bring his squeegee. During the pregame open, Olczyk, a former NHL player and head coach, pulled out a squeegee and wiped the off the boards to demonstrate how difficult it was to see. The squeegee worked overtime in the third period and beyond. Being ice level was certainly a different perspective. Sitting higher in a hockey arena gives an announcer a chance to see the entire play develop. The view of the Flyers and Pittsburgh Penguins Stadium Series game on wet glass at Lincoln Financial Field on Saturday, February 23, 2019. It would have been even more difficult to identify players if NBC had to move its announcers to the football press box. That was the contingency plan. The people in the production truck had no such problem. There, with 40 cameras at his disposal, director Charlie Dammeyer had rows of monitors to view. How does he know what one to look at? “The one that is program,” he said. That’s the monitor with the shot the people see on television. In the production truck, into which NBC allowed a visit by The Inquirer for part of the first period, it was calm, controlled chaos. Communication is as important in the truck as it is among the teams they are covering. Voices weren’t raised, as snap decisions were made by producer Matt Marvin, Dammeyer and the rest of the crew. Case in point came late in the first period after Flyers’ Wayne Simmonds leveled Brian Dumoulin with a hard check. Pittsburgh’s Kris Letang went after Simmonds and the teams exchanged unpleasantries. Eventually, Simmonds and Letang got two minutes for unsportsmanlike conduct, and NBC was on its game. “Real time take 12” said Dammeyer, referring to camera 12 and the current action live. "Take 33, take 34, take 15,” he said, commanding the switch of cameras in staccato-like rhythm. Back and forth it went, shots of Simmonds heading to the penalty box, mixed in with replay, then back to live shots of Dumoulin getting slowly up off the ice. During that first period, there was so much action that NBC couldn’t run a planned 14-second clip of Penguins superstar and Flyers villain Sidney Crosby. The network had Crosby wear a microphone the entire game, The segment had to wait for later. Part of having a successful broadcast is having too much material, much which doesn’t get used. In this instance, NBC didn’t force it. The action was compelling enough. Some prepared video was used after the Simmonds penalty, Marvin, the producer, told the tape room, “Flash back to San Jose.” There, one of the crew members had 19 seconds of video a brawl between Pittsburgh and San Jose in the Penguins’ most recent game on Thursday. With goals from players such as Crosby, teammate Evgeni Malkin and Flyers six-time All-Star Claude Giroux, who scored the game-winner, this was an event in which the standouts stood out, observed Emrick. The same could be said for the Emrick and the crew.